Click the image for a larger version. On the left is me as I currently am, on the right is me as I was 20 years ago, hence the title, “Shag of Two Eras”. In the middle in mortal peril are my nine year old step-son and three year old daughter. An amazing illustration! My family presented me with an 11×17 framed print of the cover on Father’s Day morning. I was totally stunned. Even now, hours later, I can’t take my eyes off it. What an incredibly thoughtful gift to give to a comic book geek like me. 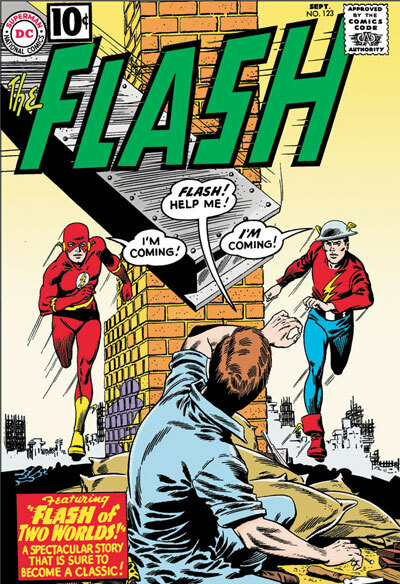 In case you’re not familiar with the homage, check out the cover of Flash #123 below (September 1961). This is one of the most important comic books in publishing history. 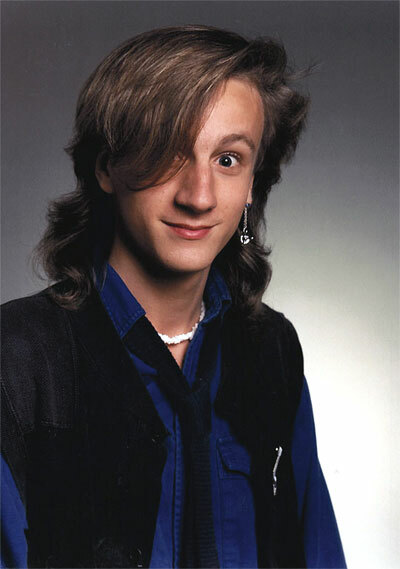 Just for reference, here are pictures of me nowadays and back in 1988. I’ve known the artist, Billy Penn, for over 15 years. He shopped at the comic book store I managed when he was in high school. Now he’s a high school art teacher himself. 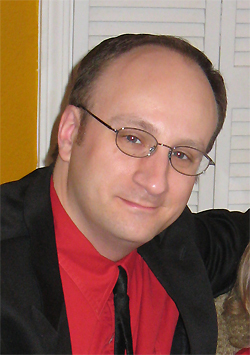 He’s incredibly skilled and has a few published works, including Platinum Studio’s Hot Shot and Mighty Girl original graphic novel, and a back-up story in Savage Dragon #130. I’ve always been impressed with the way he draws faces. They are so wonderfully expressive! I’m amazed at Billy’s attention to detail in the commission he did for my wife! He reproduced so many details from the Flash cover while making them specific to me. Some fun details that you might miss include: the shape of the comic logo, the ONCE UPON A GEEK circle in the top left, the date and the comics code authority seal, the body language of the Flashes and the two Shags, the skyline of my hometown in the background, all the goofy 80’s trappings legitimately worn by me back then, and the accuracy of my children’s eye color and clothing. As I mentioned, I was completely surprised and stunned. What an unbelievable gift!!! Its comic books and my children… all rolled up into one. My wife is an amazing woman. This is a gift I’ll cherish forever. A magnificent achievement in conception and execution! A triumph! That is 10 pounds of awesome in an eight-pound bag. That’s really cool. Brilliant, even. Tell your wife, from your friends, she did an amazing thing. Definitely something extremely special to look back on in the years to come when your children are older. Of course, you probably shouldn’t show your children’s friends when they’re teenagers. That’s a really neat gift. Quick question though; are you sure that picture of you “now” wasn’t taken in the eighties? Because that is one thin tie. Brilliant! What an astounding gift! Wow! Just got to echo what everyone else has been saying – stunning art, best. present. ever., and your wife is incredible for organising this! I got shoes. They are nice shoes though. Not only is it “Astounding” and “Amazing”, it’s “Fantastic”, “Uncanny” and “Incredible”. I’d even go as far as to say it’s “Web of”! That is a beautiful sentiment and the greatest thing a geek dad could get. I have framed comics with my letters in them and I thought that was the greatest thing ever but this blows them all away. 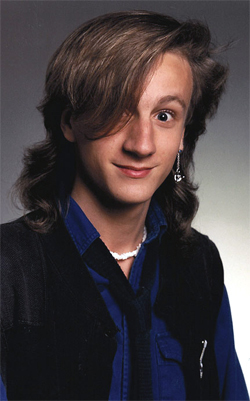 However, I just got to say it, WHAT THE HELL WAS WITH THAT HAIR twenty years ago dude? I mean I got a perm ONCE but that is…freaky. The eighties really messed us all up didn’t they? Wow. Just wow. I take my hat off and hold it to my chest, then give a solemn bow to your lovely wife. What a truly cool gift. I’m glad you liked it. I had a blast drawing it. That is fantastic! Actually, awesome is probably the best word for it! Also, I’ve been following your blog for a while now, but I can’t seem to figure out a way to get on the public blog roll. I’m here, though. OMG!! You are so adorable!! What a splendid idea—magnificently executed. Magnificent gift, and that photo is truly worth a thousand words! Love it. truly awesome. wow, I am speechless. And I am glad you clarified that the image on the right was you 20 years younger because I was afraid it was supposed to be your wife. haha, and you haven’t aged a day!